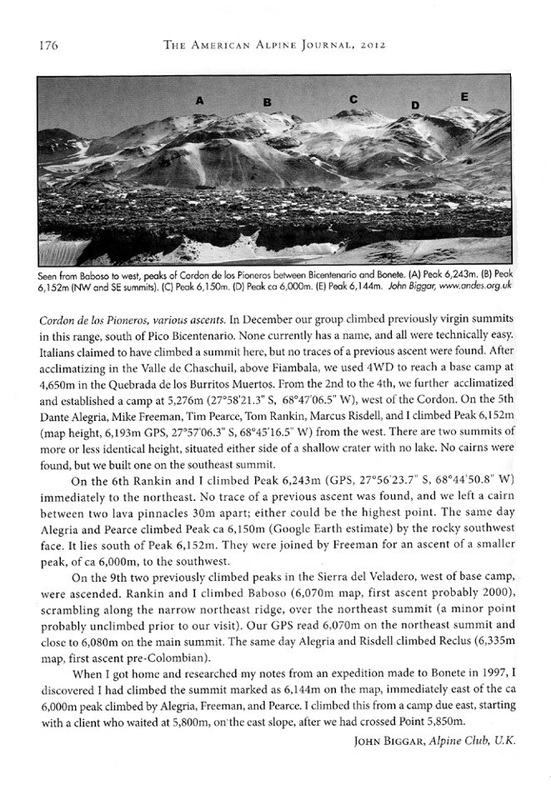 In January 2010 and December 2011 we made a number of first ascents of 6000m peaks in the high Andes of the Puna de Atacama, as reported in the Alpine Journal and American Alpine Journal 2012 (see bottom of page for extract). These were very successful expeditions with many clients making many summits. We are heading back to the same general area in December 2018, but obviously to a different (probably) unclimbed summit. This is an area of the Andes we know exceptionally well, having run many successful trips in the past twenty years. We will fly out to Salta and then be based in the mountains northwest of the wee village of Antofagasta de la Sierra for the main 13-day itinerary. This part of the itinerary will include an ascent of an unclimbed peak in the 5750m-6000m range. The main ascent will take about 3 to 5 days from a roadhead at about 4000m. We'll have private transport in a 4x4, for travelling from Salta and for getting to the roadheads. Research on the internet and in all the regular mountaineering journals shows no indication that the main target unclimbed peak has been summitted previously, but we can't guarantee this. We have certainly picked good target peaks for First Ascents many times in the past (see our Firsts page for further details). With this 2018 expedition we are offering an optional extension to climb Volcan Llullaillaco, one of the highest peak in the Andes at 6739m. Incredibly, on the summit of this peak are quite extensive ruins from the time of the Incas. In those days sacrifices were made on the summit and there is a very good archaeological museum in Salta covering this story. Llullaillaco lies on the border with Chile. We will make a (relatively) rapid ascent by the normal route on the Argentine side, since we will arrive at the peak with good acclimatisation. This extension will be a further 7 days including travel time and a rest day. For more details scroll down or click here. Like most of the peaks in this part of the Andes the ascents on this expedition will not involve any technical climbing. They will be simple walks over rough ground and perhaps some boulders. The ascents on the main expedition are suitable for strong hillwalkers. Previous expedition experience is not essential but it is preferred due to the possibility of tough weather and camping conditions. 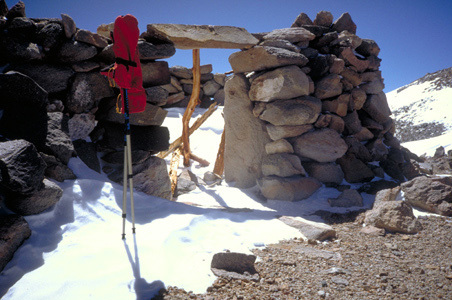 Llullaillaco is similar, with no technical terrain, but with even tougher weather and camping conditions and higher altitudes, some previous high altitude expedition experience is definitely a good idea, and we may have to use an ice-axe and crampons (but previous experience of using these is not necessary). Please call or email if you have any questions about the suitability of this trip and the Llullaillaco extension for yourself. Days 3-6 Acclimatisation, based in Antofagasta de la Sierra at 3300m. Hikes and climbs to 4500m. Hotel based. Days 7-10 Unclimbed peak c.5750m-6000m. Days 11-12 Rest in Salta and preparation. Days 18-20 Return to Salta and fly home. A few months before departure we will post a further information sheet to all paid up clients. This information sheet will have a few more details of the peak we are planning to climb and the overall itinerary. Clearly we don't want this information to be widely available at an early date as there would then be a risk of someone else climbing "our" unclimbed peak first! Please phone the office if you'd like to discuss the nature of the peaks we plan to climb, or the trip in general, or just want some more clues about what will be involved before booking. Pictured Above:- On the summit of Laguna Blanca Sur, 5900m, 2016 ANDES "First Ascents" expedition. This peak proved not to be a first ascent because the Incas had been there before us....! You can just make out a wall and a pile of their firewood in the centre right of this photo. However this expedition went on to make a (probable) first ascent of the highest peak of the Laguna Blanca massif, at 6012m. It appears the couple who made the first claimed ascent of Laguna Blanca in 2006 probably only ascended the southern summit of the main peak! From Salta we'll drive long and dusty roads to the wee village of Antofagasta de la Sierra at 3300m altitude. We'll then be based here in a hotel for four nights to acclimatise. 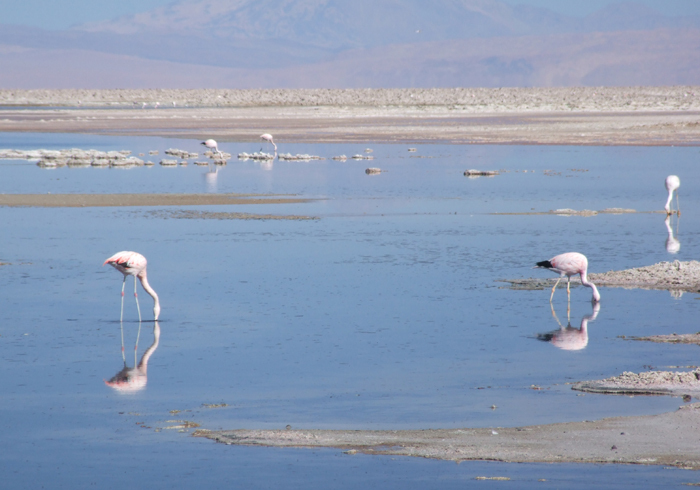 The surrounding area is exceptionally scenic, and one of the best places in the Andes to see flamingoes and rheas. There are numerous lagoons, volcanic cones and lava flows which we will explore on our first days at this altitude, and nearby are peaks of 4000m-4500m which will make for good acclimatisation ascents later on. Flamingoes near Antofagasta de la Sierra. 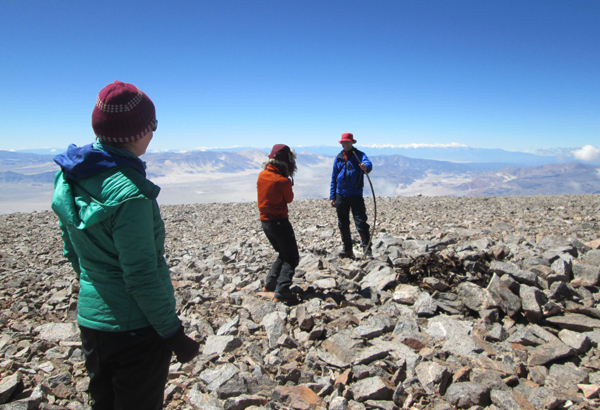 We are offering an optional extension with this expedition to climb Volcan Llullaillaco. At 6739m Llulaillaco is the 7th highest peak in the Andes. It lies on the border with Chile. Before travelling to Llullaillaco we'll have a rest day back in the city of Salta. This extension will be a further five or six day mountain trip after the rest day, and gives a 20 day itinerary overall, running from 1st to 20th December. The cost for this extension is £1095, plus estimated additional hotel, trek and travel costs of £400. We'll take a maximum of three clients on this extension, and we'll need a minimum of two to run it. Llullaillaco is mainly a walking peak, with the summit being one long day from a high camp at about 5800m. However we prefer that clients think of it as an easy walking peak for experienced mountaineers. The constant cold and extreme altitude make this one of the toughest peaks in the Andes. This trip and extension will be guided by John Biggar (barring exceptional circumstances). 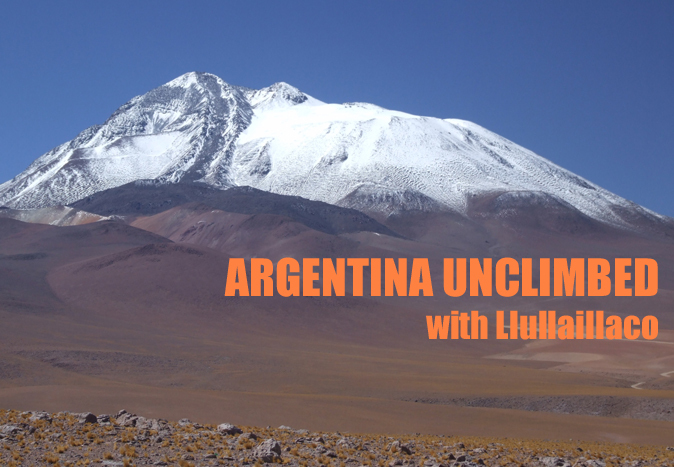 John has summitted Llullaillaco twice. 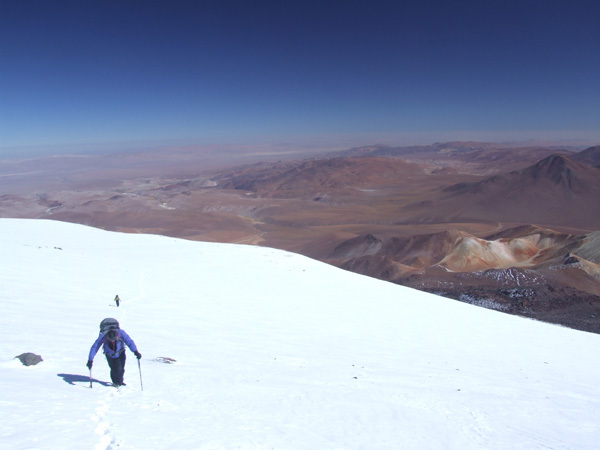 Climbing fresh snow high on Volcan Llullaillaco, at about 6400m, photo taken on the 2009 ANDES expedition. Although there is no difficult climbing involved in the ascents planned on the main expedition, climbing to heights of around 6000m is still a serious matter because of the lack of oxygen at high altitude. We will allow plenty of time for expedition members to acclimatise to the altitude but because of the nature of the expedition we recommend clients to have previous successful experience at altitudes of 4000m+. Clients should be prepared for cold nights camping and be prepared for windy and dusty conditions at times out in the mountains. As we'll be several days from the nearest supermarket there will be some tinned and dehydrated food in our diet during our time in the mountains. All clients are expected to help with the routine work of this type of expedition; pitching tents, cooking and washing up. Above base camp in the mountains we will be unsupported and therefore will have to carry expedition weight (20kg) rucksacks uphill for a half-day or so to establish high camps on the mountains, so some recent experience of backpacking is essential. The climate at altitude in Argentina is very cold and extremely dry. In the mountains temperatures can fall to -10ºC at night. During the day in the mountains it can feel very warm in the strong sun, but it can also be bitterly cold and windy. It will probably be dry all the time we are in South America, although there is a chance of an occasional thunderstorm and/or a snow flurry in the mountains. Strong winds, often up to gale force, are common. Temperatures in the city of Salta and in other low lying areas will be a very pleasant 25-30ºC during the day. Our price also INCLUDES all mountain services such as provision of tents, stoves and all other communal camping equipment, all mountain food including all camp food and lunches on day trips. It also INCLUDES any communal mountaineering equipment that may be necessary, and on most expeditions emergency use of satellite telephone link. Our expeditions are designed to be small and flexible. The expedition will be co-ordinated, organised and lead by us, but we will consult and involve the expedition members when planning the details of the trip. Please note however that the leaders decision is final where the safety of the group or any member is in jeopardy; for example where retreat or diversion is necessary due to illness or bad weather. The minimum number of customers we need to run this expedition is three. The maximum size of the main expedition will be four customers plus leader, with a maximum of three clients on the extension. 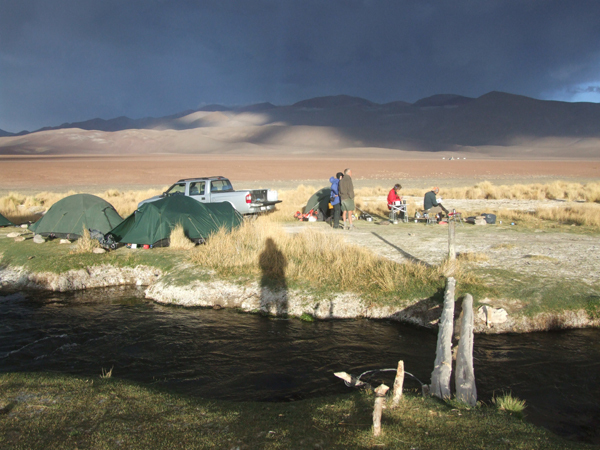 Acclimatisation camp at 3500m in northwest Argentina, November 2011. We saw a Puma near here the next day. All clients must be insured for medical costs and repatriation in an emergency. We recommend having insurance for baggage, personal liability and cancellation as well. If you would like advice on insurance please ask. Please bring an extra copy of your insurance certificate on the expedition for the leader. Vaccinations for tetanus, typhoid and polio are recommended. Argentina is one of the most well developed countries in South America and in rural areas crime rates are very low. The country is very safe and relaxing to travel in; theft and muggings are as unlikely as they are in most British cities. One of the ruins on the summit of Volcan Llullaillaco. This is an adventurous mountain trip and all clients will be exposed to an element of risk by taking part in this itinerary. While we take all reasonable precautions to reduce risk it is neither possible nor desirable to completely eliminate these additional risks. It is important that you understand the risks involved before signing our booking form. We have identified the following areas as the principal additional risks of this itinerary. This is not a fully inclusive list - please ask if you would like to see a more detailed risk assessment of this itinerary before booking. Driving, hotels and general safety : In Argentina driving standards, fire safety standards and general safety standards are not as high as in Europe. Extreme remoteness : You will be camping in a remote area, up to two days walk from the nearest road, for an extended period of time. Therefore obtaining medical assistance for any problem will be a slow process. Weather : These mountains are occasionally affected by severe and sometimes dangerous thunderstorms and occasional unseasonal heavy snowfalls. High winds are common and storm force winds at altitude can endanger life. Forecasts are not so reliable. Mountain Hazards : In certain places you may be subjected to a slight risk of slips and trips. Extract from the American Alpine Journal 2012, detailing our extremely successful November 2011 "First Ascents" expedition to the Puna de Atacama in Argentina.